Tomorrow, August 17th, I will be exhibiting some props at the Burlington Mini Maker Faire in North Carolina. I wrote up some more details about it a few days ago. There’s going to be Stormtroopers, robots and even a space launch. That’s right, they are going to launch a balloon into (near) space from the mall parking lot. I never thought I would live to see the day I could type the previous sentence. The Library of Congress has a massive collection of digital images and photographs from throughout US history. It is an incredible resource for finding or creating specific paper props or for general research. I use their newspaper collection quite a bit. I’ve linked to a few of blacksmith Tony Swatton’s videos in the past; he has a new one up where he creates Link’s Master Sword from the Legend of Zelda series. The result is an amazingly accurate replica of a sword which exists only in a video game, built out of the materials which a real life sword would be made from. It is far more intense than the Master Sword I created a few months ago, but then again, I don’t have a whole team of specialized metal artisans working in my shop. Here is an article on Patrick Drone, the props master at the University of Michigan. In recent years, he has begun working at Henry Ford’s Greenfield Village, where he maintains a fleet of early Model T and Model A vehicles. He says the work is not unlike that of a props shop. The guys at Tested recently visited The Hand Prop Room in Los Angeles to tour through their 1,000,000+ props. I often wish I lived close by to a props rental house that contained everything; then again, I probably don’t have the budget for that. I guess I’ll have to make my own. Tony Swatton, who we’ve seen on this blog before, has a new video where he builds a set of Wolverine’s claws from scratch. They are 18-gauge steel, and they are SHARP! Vermont Public Radio has a story on 50 years of the Bread and Puppet Theatre. I first saw these guys around 1998 or so, and again just last year. Their performances are fun but compelling, and the design and construction of their puppets have almost certainly influenced many contemporary puppeteers. Speaking of puppets, a few months ago, puppeteer Emily DeCola, of Puppet Kitchen, was struck by a cyclist while crossing the street. Her injuries left her with crazy medical bills and the loss of her sense of smell. Her fellow puppeteers have organized a puppet cabaret fundraising event for her TONIGHT, so if you’re in New York City, why not check it out? If not, you can always donate to the cause. Emily worked on a number of shows while I was at the Public Theater and Shakespeare in the Park, and her work is always amazing. Propnomicon pointed me to this great two-part tutorial on making a shrunken head. It steps through the molding, casting and finishing of a clay model. Finally, enjoy this small collection of 19th-century collector cards featuring various trades, such as woodworking and blacksmithing. 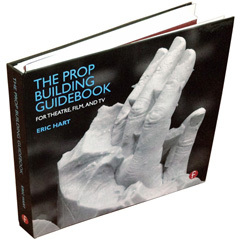 You have only a little more than two weeks left to enter my Prop Building Guidebook Contest! Don’t wait until the last minute to enter. I also wanted to point out that a week from Monday (April 22nd), you can start voting for your favorite prop in the contest; tell your friends they can vote for your prop once per day until the contest ends on April 30th. In addition to winners in each of the individual categories, the prop with the most votes will win its own prize category, so vote early and vote often! And now, onto the links. I came across this short interview with Mickey Pugh, prop master on films such as Saving Private Ryan and Last of the Mohicans. From the prop masters email list this week comes Click Americana, an ongoing collection of vintage photos and ephemera from all decades of American history. You can search for specific topics or just browse through by decade, from the 1820s to the 1980s. It has a whole section dedicated to recipes, too, great for when you need to provide period food. 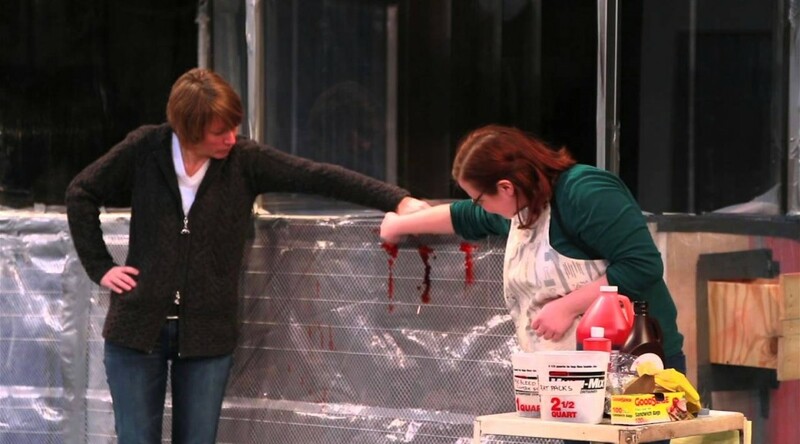 And finally, if you missed my Tweet this week, I shared this video looking at the blood effects in Trinity Rep’s Social Creatures, a “zombie” play now running. Production director Laura Smith and assistant props master Natalie Kearns show us how they make the blood and organs squirt and fly. I’ve linked to some repositories of old maps before, which are always good for making paper props. But the Propnomicon website pointed me to Old Maps Online, which gives you an interactive interface to find historical maps within whatever date range you specify. It’s kind of like using Google Maps while traveling through time. Speaking of vintage ephemera (and musical theatre), Gaytwogether is a blog which occasionally posts vintage photographs of gay couples, which you can browse through all at once at that link. La Bricoleuse has just posted the final projects from her class on complex masks. Though little is written, the photographs give a lot of information about how the various masks were made, and it is very interesting to see the various methods of construction and the materials used. Most of us know the Project Triangle: “fast, cheap and good—you can have any two”. For those who don’t, Jesse Gaffney has just posted a good description of it, along with examples. If you study the technical side of some of the materials used in making props, you may know that “polymerization” is what happens when a resin changes from a liquid to a hard plastic (among other things). If you read MSDS sheets (which you should), you may also have come across the phrase “explosive polymerization”. If, like me, you are wondering what that means, you may be interested in this video; it has a long build-up, but the payoff is worth it. I’m still catching up with a lot of things; you may have noticed Monday’s post did not appear until Tuesday. First up, I want to mention that Puppet Kitchen will be giving a live chat interview today at Theatre Face, starting at 2pm (E.S.T.). We’ve worked with them together and individually on a number of projects here at the Public, like The Bacchae and Hamlet, and will be joining them again on our upcoming production of Compulsion. Check it out! The Replica Prop Forum is posting a three-part interview with John Dykstra, perhaps best known for creating the visual effects on a little film called Star Wars. The LA Times’ Hero Complex has an interview with Barry Wilkinson, prop master for all the Harry Potter films. He’s constructed over 500 magic wands just for the final film alone. Archaeology Magazine has some nice scans of a complete passport from 1919, among other things (Thanks to Propnomicon for the link!). And since I mentioned puppets earlier, Mary Robinette Kowal has a short but sweet post about the plant from Little Shop of Horrors and the differences between props and puppets.